​Annabel Stanley was born and brought up in England. She is the great grand niece of Sir Edwin Lutyens. She left school in the early 80’s and went on to study Horticulture at Merrist Wood Horticultural College near Guildford, Surrey. She worked her practicum at Pepiniere Meunier (a plant nursery) in The Loire Valley, France. Moving to London she trained to be a Florist at Veevers Carter Flowers in Chelsea and spent the next 4 years serving high profile clientele such as Harrods, Tiffany’s the Jewelers, and Estee Lauder, along with decorating the Christmas tree for the Duke and Duchess of York at Buckingham Palace. She met and married her Canadian born husband, Grant Stanley and they moved to New Zealand in 1992 where they were introduced to the world of wine. Annabel worked for Cloudy Bay Winery in Malborough in their propagation department and Grant started his career as a winemaker. They moved to the Wairarapa and Annabel opened up her own flower shop specializing in weddings and was inspired to start weaving sculptures with vine canes, dog wood, willow, wire , moss and other materials which give a vibrant natural effect . This started her career as an artist, holding exhibitions and speaking engagements around the country as well as giving workshops to local elementary schools. 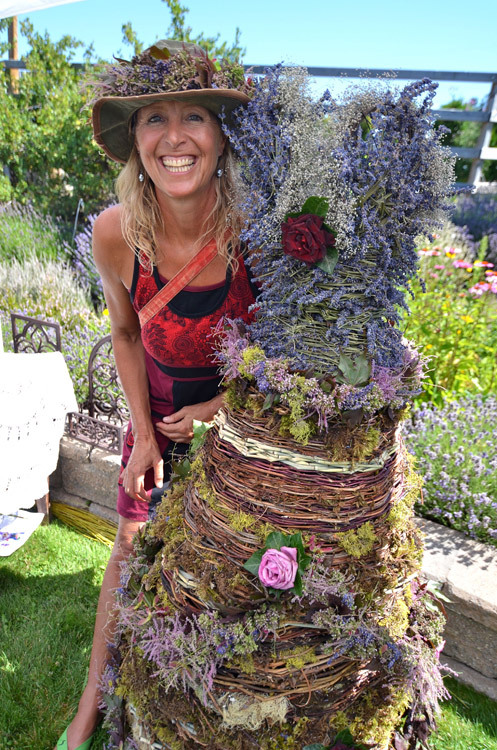 Annabel has been featured in the New Zealand Gardener, New Zealand Cuisine, the first issue of Sculpture Pacific in Canada, and appeared on National TV in New Zealand . Annabel, Grant and their son Francis relocated to the Okanagan in 2003 and Grant became the winemaker for Quails Gate Estate Winery for the next decade and onto 50th Parallel winery of which Grant is the consulting winemaker. They purchased their own vineyard in 2005, Coyote Vineyard, which is a source for her weaving materials. She has continued with her Art, holding several exhibitions and sharing her passion and knowledge with local schools and local groups of artists, including Cool Arts which is dedicated to providing fine arts to adults with developmental disabilities. Her influences have been willow artist Serena de la Hay and environmental sculptor Andrew Goldsworthy. 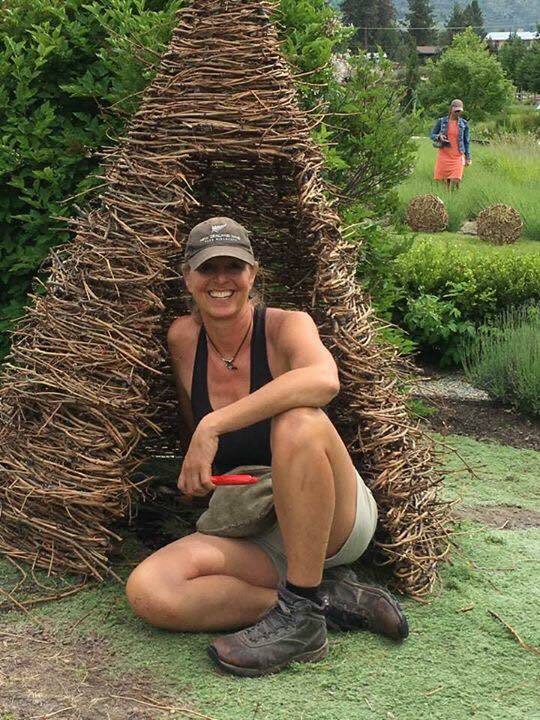 She has also studied with Peter Faulkner, a coracle builder (hazel and hide small lightweight boats), learning new styles of weaving with Martha Cloudsley from BC and trained in willow sculpture with Julieann Worrall Hood in Wiltshire England. Annabel has always had her feet planted firmly in the soil as her hands reach up into the branches of the trees and she loves to share this passion with young minds, getting them outdoors and appreciating and creating with nature.